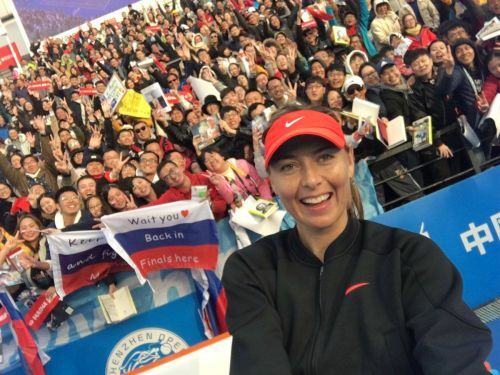 Maria Sharapova once again showed her talents that were in fine form to begin the new season at the Shenzhen Open Monday. The Russian superstar won six straight before fighting to contain a straight sets victory over Timea Bacsinszky with a 6-2, 7-6(3) scoreline on center court at the Shenzhen Longgang Sports Center. Their fifth meeting marked the first in four years between the two veterans on tour. Sharapova won their last match marking her third and hoped to get the ball going her way. The Russian who got back into the top 30 last season decided to call off the Asia tour to be ready for this very moment. Last year, the 31-year-old made the semifinal putting a real show of strength to be back for more. The Swiss finalist from 2015 also vied to return there and give Sharapova a rough time on court but her facing similar competition didn’t come much for her last year. Bacsinszky would more than face a huge challenge but would try to pull some tricks out of her sleeve. She started the match with a win to set the bar high for Sharapova who wasn’t yet ready to answer with the same level of strength. She double-faulted at the wrong time giving Bacsinszky the break but it was the start to the tables turning. The Swiss veteran made three during her service game in the third to put the Russian on the board. It was the point that helped the 31-year-old dictate her own hits across the court. She took a toll against Bacsinszky who suddenly lost her focus and struggled on the serve. It became a dead spin for the Swiss star who allowed Sharapova to take the lead away. She consolidated the break with a sense of comfort that allowed her to control the remainder of the set. The world number 29 won the next three straight that ultimately ended in a six-game winning streak to complete the set in 35 minutes. Bacsinszky tallied four double faults and went quiet on the returns winning just 2 of 21. Sharapova fell behind quickly giving Bacsinszky a 2-0 lead but the issues came to fruition. The Swiss star had trouble serving tough shots that came back as difficult returns. The Russian got even after four but it was a fight to the finish between the two. They traded off break points with one another that led them to make it a very tight run. Bacsinszky had chances to put the second set away but Sharapova always found ways of opening the door. She succeeded in covering the deficit at the late stages to force the Swiss star into more games. Bacsinszky gained the lead but it was again a tough uphill battle for the 29-year-old. She was left with no choice but to play a tiebreaker with the former world number one to see if she could push her to the distance. It was not meant to be as Sharapova raced to a comfortable position while Bacsinszky struggled to get the points. It was soon 6-3 and match point for the Russian who won it on a return that landed wide on a challenge to bring an end to 1 hour and 42 minutes of action on the court. Obviously, this match had a difficult opponent and tough conditions for the both of us,” Sharapova said after the match. “It’s been a few months since I’ve been out playing competitively so considering the opponent and everything I had to go through today I thought it was great practice for me.” She’ll await the winner between Chinese players Fang Ying Xun and Xinyu Wang.